This 8- DVD combo pack regales you with a delectable fair of Ashtanayika the eight heroines categorized by the natyashastras according to their attitude and approach to love. It is an an exhaustive and aesthetic exploration of the mindset, moods, conflicts, desires, dilemmas, tempers and tantrums of those lovelorn ladies referred to as Abhisarika, Kalahantarita, Khandita, Proshitapatika, Swadheenapatika, Vasakasajjika,Virahotkantita, Vipralabdha. 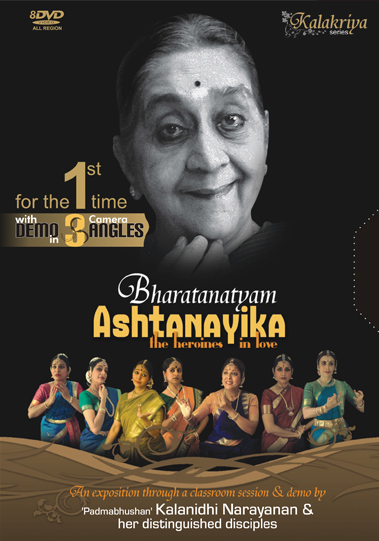 The highlight of the product is a classroom session involving Smt.Kalanidhi Narayanan, ('Maami' to her students), the legendary Abhinaya exponent of our times & a bevy of her brilliant disciples Together, they discuss the attributes of each nayika aided by a host of padams and javalis from the repertoire of well-known composers like Kshetrayya, Ghanam Krishnaiyer, Karvetinagar Govindaswamy- to mention a few.